Metallica’s Robert Trujillo says the band have been working on new album ideas while they’ve been out on the road. 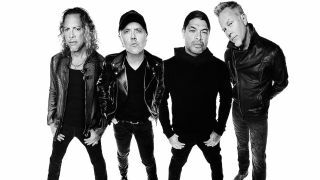 The bassist tells The Music that they’ve been “jamming” new material on their WorldWired tour and has hinted what the follow-up to 2016’s Hardwired… To Self-Destruct could sound like. Trujillo adds: “We have a zone we call The Tuning Room, which is a space where we can jam and warm up before the show. We're always in there coming up with ideas and you may get a few seconds of an idea, but everything is recorded, always. “Death Magnetic was, for the most part, a collaborative effort. Hardwired was more central to James Hetfield’s specific ideas and was also taking the spirit of what we had done on the previous record. Metallica recently wrapped up their latest run of North American shows and will head back across to Europe in May. The band have just released a live video showing their performance of Sad But True from Wichita which can be watched below.